What do we know about music therapy for cancer patients? We know that music has a large effect on us in general. It can make us smile when we're feeling stressed. It can take us out of a robotic "do" mode and put us in touch with our "feeling side." But what about people living with cancer? Do studies tell us what our hearts do—that music can make a difference? Research hasn't disappointed and seems to say that the sound of music really does help people climb the mountains we call cancer treatment. It can even cause our hearts to beat—not like a bird—but in healthier ways. There are now 30 National Cancer Institute designated cancer centers which offer music therapy as an integrative treatment for cancer. There have been a surprising number of studies done to examine potential benefits of music for cancer patients. It would seem we're guessing intuitively that music has a role. What have we learned? The emotions that accompany cancer can feel like a roller coaster sometimes. And that roller coaster can go both directions—it seems—in just a matter of minutes. Does music help people cope with the emotional ups and downs? How about the fears? 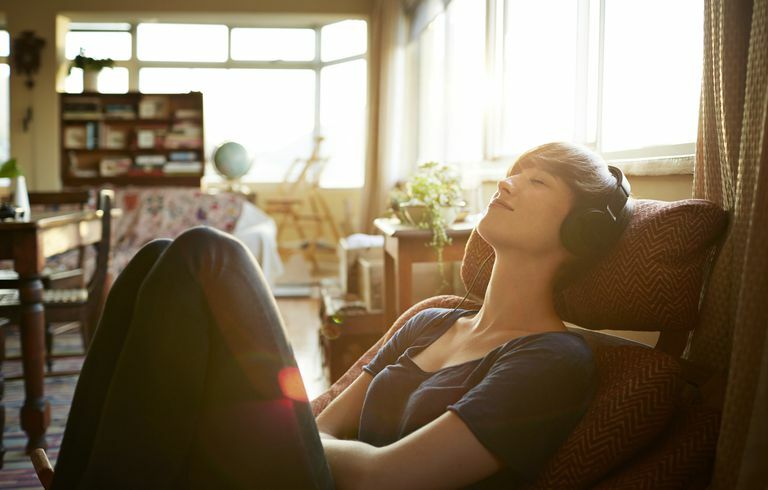 Reduced anxiety and improved mood: A few reviews have looked at several studies to date evaluating the effect of music on mood and anxiety in people with cancer. The overwhelming conclusion of these studies was that music decreases anxiety and has a strong positive impact on the ability of people to cope with cancer. Study subjects included those who took part in music therapy as part of a hospital program, as well as people who simply listened to recorded music. One of the reviews also found that music could be helpful in alleviating depression related to cancer. Improved quality of life: A review of studies looking specifically at patients in the palliative care setting confirmed these benefits and more, concluding that music was associated with an improvement in the overall quality of life for these cancer patients. Better pain control: A decrease in pain was noted in some of the studies mentioned, but the effect of music on pain was studied specifically among people who were undergoing surgery for lung cancer. These patients not only experienced less pain than those who weren't offered music therapy but had a reduced need for pain medications. Since pain medications can have significant side effects, this was an encouraging finding. Decreased shortness of breath: At least one study has delved into studying the effect of music on the sensation of shortness of breath, with music decreasing the sensation of breathlessness while providing meaningful spiritual support at the same time. The physical benefits of music haven't been studied to the degree of emotional benefits, but what we have seen thus far is encouraging. Effect of vital signs: Modest improvements in vital signs have been seen among cancer patients participating in music therapy studies, including a decrease in heart rate, a decrease in respiratory rate, and a decrease in blood pressure. Increase in natural killer cells: A few studies on healthy volunteers have found that listening to music resulted in an increase in number as well as the activity of natural killer cells in the body. Natural killer cells are an aggressive part of our immune system that aids in eliminating cancer cells. Few people experience cancer in isolation, and some cancer survivors have even remarked that they believe their cancer experience was harder on their loved ones than themselves. Cancer is a family disease, and we tend to forget the needs of those who are busy meeting the needs. Thankfully one study looked specifically at those who were caring for a terminally ill loved one with cancer. These caregivers and cancer patients were offered a home music therapy program, and results indicated that not only did the cancer patients appreciate this program, but there was a double benefit for caregivers. A double benefit? It can help to remember that one of the greatest frustrations for family caregivers of terminally ill cancer patients is the feeling of helplessness. In this study, not only did the caregivers experience their own joy (which would be called autonomous joy), but they also experienced "caregiver joy." The opportunity to provide music granted these caregivers a sense of empowerment. They were able to do something concrete for their loved one while their loved one was still alive. This benefit lasted beyond the loss of their loved one. Following death, the caregivers were able to look back at the time they shared music with their loved one with a sense of joy and connection, feeling filled with happy memories and "sentiments of hope." Of course, there could be a few side effects with music. If the music makes you want to dance a jig the day after you have surgery, this may not be wise. It's probably best as well to avoid music which would remind you of a difficult stage in your life that you don't care to relive. But, in general, music appears to provide some positive comforts with little fear of side effects. How can you add more music to your life as you cope with cancer? Take a moment to brainstorm. Do you prefer playing music or listening to music? Is there an instrument you have that's getting dusty? Are there CDs hiding in a closet that you put there meaning to listen to a decade ago? Then, think about what types of music you like. What music makes you feel good? One woman with cancer dug out music she had used when she gave birth to her daughter. She found that using the same music during chemotherapy not only gave her the sense of calm she had back then, but also filled her with precious memories. For some of us, a labor tape might not bring thoughts of relaxation, but the point is the same. Think about the ways music has brought you joy in the past. Of course, not all music will be helpful. Hateful music or loud heavy metal might not be the best, but it depends on your personal likes and dislikes. In studies looking at immune function, it was found that "alkaline music" was one of the best. Music in this category would include things such as soothing classical music, east Indian music, harp music, and Brazilian guitar for starters. Ask your friends or people in your cancer support group what they enjoy. It's likely you'll hear some strong opinions! Some cancer centers provide music therapy or have music on hand for you to borrow. For example, the University of Michigan Comprehensive Cancer Center provides CDs you can borrow, with a few songs you can download from their website. Check the collection of music you have, your iPod, or your library. YouTube provides a quick way to play many a song. It seems people are always wondering what kind of gifts to bring someone with cancer. Perhaps music would fit the bill. We'll share the list we use for picking out music to relax with and have not been disappointed. Check out these top 7 CDs for relaxation and stress relief. If music is just not your thing, or if you are looking for further creative ways to cope with your cancer treatment, there are plenty of ideas. For example, art therapy was one that I participated in myself and truly enjoyed—and I'm not an artist. Check out these art therapy benefits and resources for people with cancer. Or perhaps you've been thinking of journaling your cancer journey. Check out these benefits and tips on journaling for cancer patients. Archie P, Bruera E, and Cohen L. Music-based interventions in palliative cancer care: a review of quantitative studies and neurobiological literature. Supportive Care in Cancer. 2013. 21(9):2609-24. Bradt J, Dileo C, Grocke D, and Magill L. Music interventions for improving psychological and physical outcomes in cancer patients. Cochrane Database of Systematic Reviews. 2011. 10(8):CD006911. Burns D, Perkins S, Tong Y, et al. Music Therapy is Associated With Family Perception of More Spiritual Support and Decreased Breathing Problems in Cancer Patients Receiving Hospice Care. Journal of Pain and Symptom Management. 2015. 50(2):225-31. Koyama M, Wachi M, Utsuyama M, et al. Recreational music-making modulates immunological responses and mood states in older adults. Journal of Medical and Dental Sciences. 2009. 56(2):79-90. Magill L. The spiritual meaning of pre-loss music therapy to bereaved caregivers of advanced cancer patients. Palliative & Supportive Care. 2009. 7(1):97-108.